The road side foods are specialty of Indian cities and reflection of India’s culture and tradition,stall vendors of street offers different kinds of delicious and tasty food such as famous chole bhature,Parathas, pitha, chotpoti,puchka, jhalmuri, badam and various fried items. The street vendors of Indian cities also sell sweet items and drinks including Lassi plain or salty,fruit flavored juice, Sherbet,Jaljeera, Neera and other seasonal drinks. Some of major Indian cities are well famous for street food items like Delhi for chole bhature,Indore Poha jalebi, Mumbai for Vada Pao and Kolkata for all types of rolls. The must try road side Indian food is a mouth watering food item also known as Gol Gappa in Northern India and Poochkas in West Bengal. Pani Puri is best street food from India and the most favorite of Indian girls. Gup chup or Pani Puri is originated from Bihar the Magadh region of India and now available across every street of India. The most popular Indian street food is a small, round, crispy semolina shells stuffed with spice and potato and servers after digging into tangy water, The Water used for panipuri is mixed with Indian spices, amchoor powder and salt. Other variants of Pani puri are Dahi puri and Sev Puri. Chaat or Aloo tikki is another most famous Indian Street Food item available from every village to all Indian cities. Tasty evening snack item is originated from Uttar Pradesh state and become very popular in rest of India and the Indian Sub-continent. 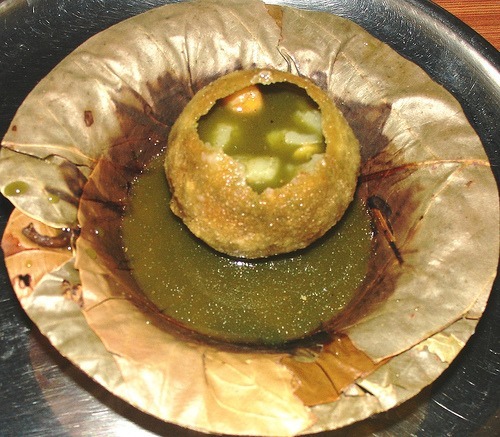 The most famous area for Chaat are Agra and Mathura, taste can be vary from city to city. Mumbai’s Chowpatty Beach is world famous for stalls different variety of chaats and other street foods. 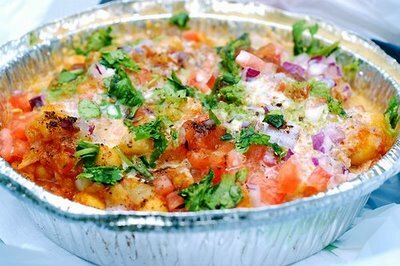 Chaat is mostly served at road side stall or by vendors around, other variant of Chaat are Papri chaat,Aloo Chaat and Dahi Chaat. Bhelpuri or simple Bhel is a savoury snack item or kind of Chaat, made out of puffed rice, onion,potato and a tangy tamarind sauce. Major ingredients used to made Bhel are tomatoes, onions,chilis Sev,Chat masala and chutney. Type of chutneys is the responsible for the flavour like sweet,tangy or spicy. 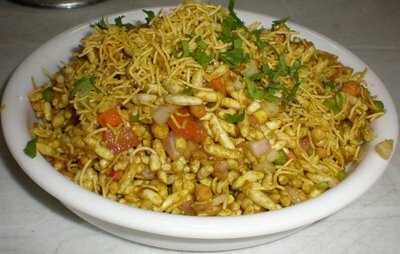 Bhelpuri is called Jhaal Muri in Kolkata, Churumuri in Bangalore and a dry version popularly known as Bhadang in Maharashtra. Jhaal Muri is a different snacks item sell by vendors around the street markets of city. The savoury Indian snacks is created from Maharashtra and got famous to rest of India. Poori is an Indian fried bread served with gravied potato curry or sweet tomato chutney,Pickle,chana masala along with halwa. 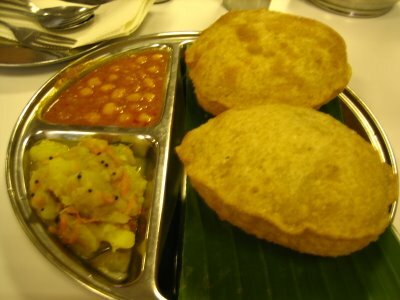 Poori Sabji is one of the most favorite breakfast item in India, It also best during the travel as well as for picnic. The fried bread of India is very popular among all age groups and enjoyed while having in breakfast, lunch or dinner. Poori is also made up during the traditional festivals or during any Puja and served with kheer and halwa so also called as festive food. variant of puri is bhatoora, Its three times bigger then one size of a puri and served with chholey and pickle, the luchi from Orissa is another form of Poori. South Delhi is famous for Poori Sabji, bhatoora and delicious Parathas. Pav Bhaji is the traditional fast food dish native to Maharashtra and one of the most famous street food in metropolitan areas of India. Pav means a small loaf of bread which served with Bhjai,vegetable dish especially in the central and western Indian states. The quick meal of Indian street as well as Indian restaurants served with butter fried pav,or some more varieties like Cheese Pav Bhaji,Paneer Pav Bhaji and Mushroom Pav Bhaji. 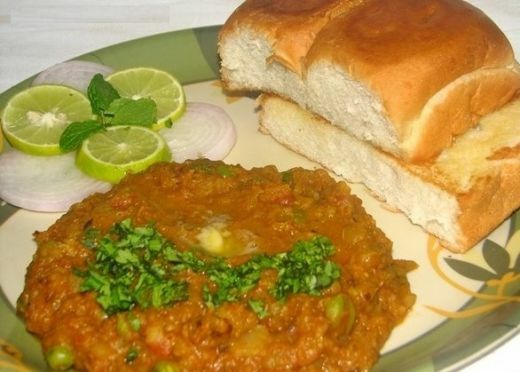 Pav Bhaji is one of the most common snack to have between lunch and dinner, it is also a party favorite food item. Putu Mayam is a local Tamil dish made by rice flour noodle and served with sugar and coconut. 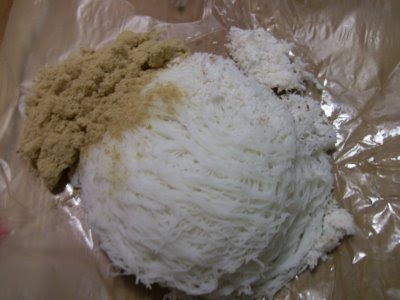 Its a type of round, steamed rice flour noodles eaten with sweetened toppings such as desiccated coconut and gula Melaka. Putu Mayam is also known as string hoppers are commonly sold as road side food from market stalls to the street of cities in carts, as well as being made at home. Putu Mayam and Idiyappam street food are the specialty of Indian states Tamil Nadu, Kerala, and coastal areas of Karnataka. Thattu Dosa is the famous street food of south India especially in the state of Kerala and Tamil Nadu.Set Dosa or Saada Dosa is a pure vegetarian delicacy served with sambar and coconut chutney. 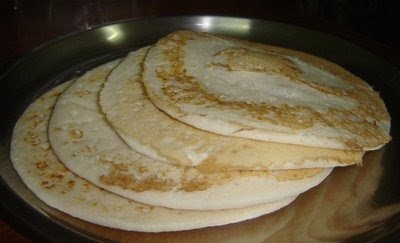 Its a mouth watering dish made by traditional form of Kerala dosas and serve by street food sellers around the state. South India is known for its high standard food items, specially road side food and eaten on the streets. There more then 100 varieties of Dosas available in south India,other famous dishes from road side stall are Kerala’s famous banana fry and idlis sambar. Fried Snacks of Indian street are perfect evening snack or a rainy day snacks item. These fried snacks may available in the restaurants but street food are the best for a better taste and experience. 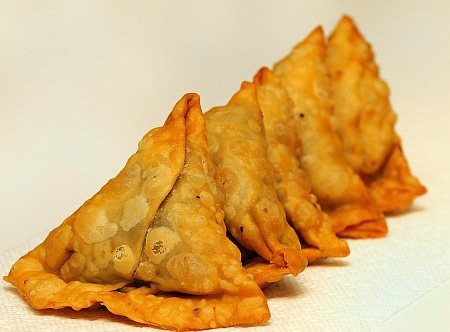 Samosa is one of most popular fried snacks serve with sweet-sour tamarind chutney or tangy chilli chutney. Bhajias, Pakoras, Allogunda, Kachori, bade, mirchi bajji etc are some of the best road side fried Indian snacks to have in the evening or in the morning with tea. Street foods of India offers varieties in terms of taste veg,desert,drinks or most favorite non-veg delicacy. 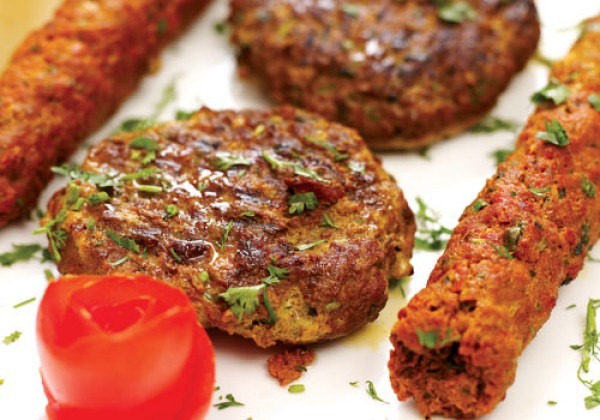 Bun-Kabab is one of the most favorite road side food to taste specially in Delhi and Calcutta. The best Indian street non-veg food Bun-Kababs, Seekh Kabab,Tandoori Kabab,Hara Kabab, Egg rolls,chicken rolls and deep fried chickens. Street food stall of India offers Punjabi, Chinese, Mughalai and South Indian non veg dishes. Hyderabad,Delhi and Lucknow are the best place to try every Non-vegetarian street food in India. 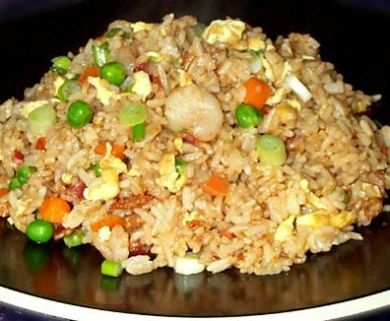 Indian street are one of the best place to try Chinese snack item like Chinese fried rice,Chicken Fried Rice and chilli chicken. Chinese stalls are available on the street of every major cities of India, specially in the evening. These snacks item are very easy to cook and taste a mixture of Indian and Chinese. Apart from Chinese other road side food like momos,noodles,mutton and desert are also available in the streets of India.